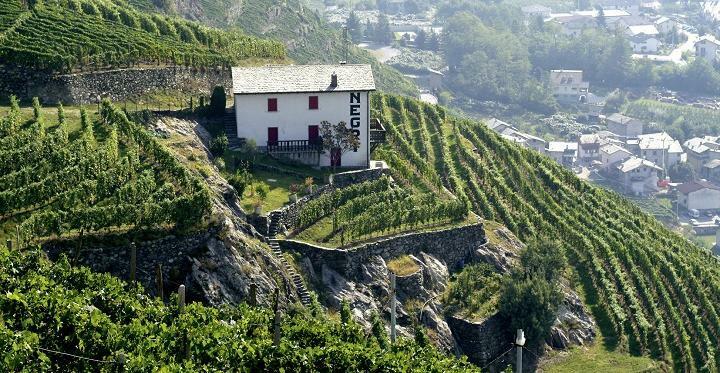 Established in 1897, Nino Negri is the premier estate producing wine in the Valtellina DOCG in Italy's Lombardy region. The estate specialty is Sfursat ("strained" or "forced"); a wine made from grapes harvested by trained pickers and dried for 100 days in the cool, dry, alpine air. This winemaking style combines the opulence of Amarone with the elegant complexity of Barolo. The success of Nino Negri is due largely to the efforts of winemaker Casimiro Maule who has worked at the estate since 1971, his entire professional life. In 2007, Casimiro was named "Winemaker of the Year" by Gambero Rosso, the magazine authority in Italian wine. Terroir of the Valtellina: The Valtellina region, located at the base of the pre-Alps on Italy's border with Switzerland, is an extremely challenging terroir. A narrow, 25 mile-long amphitheater of terraced vineyards lines the north bank of the Adda River, forming a deep gorge amid mountainous terrain. This is Italy's largest terraced area of viticulture: an impressive 1,500 miles of dry walls that support the terraces are distributed over the 25-mile strip. Working this land is backbreaking work. Steep, nearly vertical vineyards from 2,400 to 3,000 feet elevation rule out the use of any mechanical equipment. Wine Spectator 90, Top 100, #80 "Rich, with a base note of tarry smoke, remaining elegant and medium-bodied overall, showing mouthwatering acidity and fine integration. Dried mint and thyme aromatics lace the dried strawberry and cherry fruit, offset with star anise and beef bouillon details. Wine Spectator 92"A graceful red, with polished tannins and delicately knit layers of ripe black cherry and damson plum fruit, cured tobacco and accents of ground anise and mocha. Light grip graces the aromatic finish. Drink now through 2029." ~A.N.